The Epic Pass has expanded this season to include the Three Valleys, as well as Verbier, St Anton and a huge selection of US resorts. Potential embarrassment avoided as Birmingham and Manchester ski shows manage to resolve their clash of dates by combining both shows into one! The French Alps' most popular brand of Apres Ski venues is expanding again, this time into the resort of Alpe d'Huez. Tomorrow morning (Tuesday 6th August) sees direct Eurostar to the Alps go on sale for the coming season. Tickets are always in high demand, so make sure you're up early to grab the best seats! Boris Johnson yesterday announced that plans have been started to build a £200m indoor ski slope next to the Olympic Park and Westfield shopping centre. 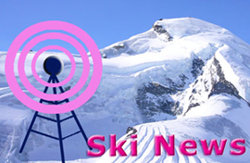 Today's Ski Industry Report from Crystal has shown that the UK market for ski holidays has increased by 1% in the past 12 months. Les 2 Alpes, one of three French resorts open for summer skiing from late June to August, has confirmed that the popular Kumi Yama (www.kumi-yama.com), which means gang from the mountains in Japanese, festival will be back on the glacier snow slopes this July. The most popular destination for British skiers in the USA will be nearly a quarter as big again next season thanks to a long planned expansion plan being realised. Comedy (and some music) is the order of the day in the Austrian and French Alps over the next fortnight with local favourites back in Méribel next week and then the Altitude Comedy Festival which was born in the French resort back in Mayrhofen, with the biggest ever star in the festival's seven year history just announced as the headliner - Eddie Izzard. US skier Ted Ligety becomes the first man in almost 50 years to win 3 gold medals in a single World Championship.